(represented on the Gohonzon Diagram by #19, the Devil King of the Sixth Heaven). He is on the Gohonzon because, in this Buddhism, instead of burying our negative internal nature, we embrace our own internal fears and delusions as a part of life. We work constantly on enlightening this part of our life. We realize that when we call forth Buddhahood from our lives, through chanting Nam Myoho-Renge-Kyo, these fears and delusions dissipate like dew in the morning sun. Two different pictures of the Dragon King's Daughter are at right. In one, she is offering a jewel to the Buddha. Enlightenment is a state of life that is even difficult for Buddhas to fully comprehend. Yet, this state of life is available to us at every moment. The Dragon King’s Daughter represents attaining that enlightenment at this moment and then perceiving our life from this state. We use this wisdom available to us to constantly move our lives in a positive and happy direction. 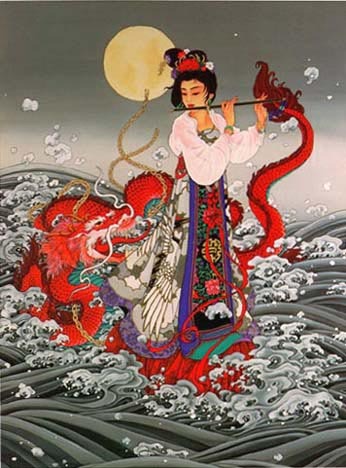 "The fifth scroll contains the heart of the Lotus Sutra, for it reveals that the dragon king’s daughter attained Buddhahood in her present form. 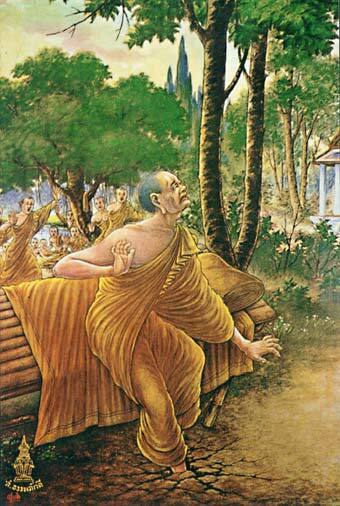 Devadatta represents the spiritual aspect of enlightenment, and the dragon king’s daughter, the physical aspect. The principle of attaining Buddhahood in one’s present form can be found nowhere else in the Buddha’s entire lifetime of teachings." The key point is that no matter what your spiritual state of life and no matter what your physical condition, the joy and wisdom of Buddhahood is always available to you at this moment.